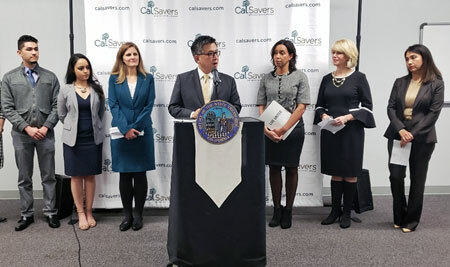 FRESNO, CA – At a launch event in Fresno today, in front of small business leaders, community partners, and Californians ready to take control of their retirement security, California State Treasurer John Chiang and former Fresno Mayor Ashley Swearengin kicked off CalSavers — a new statewide retirement savings program destined to empower 7.5 million California workers, currently without access to a workplace retirement program, to start saving for their golden years. California is a leader in the growing national movement to provide retirement savings programs to workers who lack access through their places of work. Illinois and Oregon have created similar savings programs for workers, and a growing list of additional states are waiting in the wings to follow California’s example, and similarly revolutionize efforts to ensure workers do not retire into poverty. California currently has nearly two-hundred thousand small businesses that are unable or unwilling to offer their employees a retirement savings program, resulting in four million small business employees working without any workplace retirement. In Fresno County, more than 4,000 employers and more than 90,000 employees are eligible for the retirement savings program. Today’s event is one of five being held statewide this week to launch the CalSavers program; the others being held in Los Angeles, San Diego, Sacramento and San Francisco, respectively. Experts agree that the critical mistake many workers, of all ages, make year-after-year lies in assuming Social Security benefits will manage to sustain them in their retirement years. But, with the average Social Security benefit paying less than $17,000 annually, Social Security alone is not enough to retire with dignity. In fact, nearly half of California workers are on a trajectory to retire into economic hardship, defined as below twice the federal poverty rate. And with researchers now estimating that California’s senior population is projected to increase by 64 percent by 2025, that means up to 12 million Californians may be at risk of retiring without the resources to live a dignified retirement. But access to workplace retirement programs makes individuals 15 times more likely to save for retirement, and even modest savings faithfully maintained over a career can make a difference. Analyses have shown a typical 25-year-old California worker who participates in CalSavers could amass $350,000 by the time they retired at age 65 — two-thirds of which would come from earnings on the original investments made by the saver. CalSavers will put more Californians on the path to greater financial independence in retirement without spending a cent of taxpayer monies. Additionally, there are no costs to employers, who are already registering to participate in the pilot program. Janico Building Services was the first employer in the state to sign up for the CalSavers pilot program. The law establishing CalSavers requires any employer with five or more employees, which does not already offer a workplace retirement savings program, to begin offering a retirement savings program either through the private market or by providing their employees access to CalSavers. Beginning July 1, 2019, employers of all sizes can register for CalSavers at www.CalSavers.com. However, employers can currently register for the pilot program already underway. Employers with 100 or more employees, who do not already offer a retirement plan, will have until June 30, 2020 to register. Employers with 50 or more employees will be required to register by June 30, 2021, and those with five or more employees thereby June 30, 2022. Employers of any size can register at any time, even before their registration deadline. Once enrolled, employees can choose their own contribution amount, up to the federal maximum of $6,000 — the same as any Individual Retirement Account (IRA) — with deductions made automatically from their paychecks. For more information about CalSavers or to enroll in the program, employers or individuals can visit www.CalSavers.com, email CalSavers@treasurer.ca.gov, or follow the program on Twitter at @CalSavers. To view video of event click here. For more news, please follow the Treasurer on Twitter at @CalTreasurer, and on Facebook at California State Treasurer's Office.